I have a soft spot for flowers. Some of the most amazing prints I have ever seen were enlargements of flowers – simple, yet very captivating, with color, shape, symmetry and patterns. It is not difficult to take great flower photos. And in the summer and fall seasons, there are many kinds of flowers to photograph. 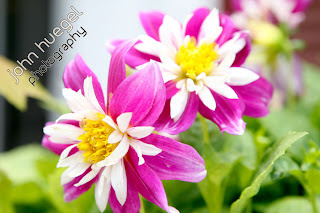 Photos of flowers make great wall prints, note cards and screen savers. Here is a dozen tips for taking great flower photos. The nice thing about them is that you don’t need a model realease! TIP 1 – Macro Mode. You’ll need to get up close, so choose a camera/lens that can focus close to the lens. You can get close-up lens attachments for some lenses. Many point-and shoot digital cameras have a “flowers” setting which is designed to get up close and focus well. When choosing a lens, note the minimum focusing distance (MFD) to see how close you can shoot and still get crisp focus. TIP 2 – The Right Light. You will need to have enough good light to capture the flower, especially if you need to use a higher F-stop (see below). Often the on-camera flash won’t project well for flowers, as it’s designed to shoot out farther. Also, direct noonday sun is often too harsh, so you may want to diffuse it with some white cloth. You can always hook up some continuous or flash lighting if you would like. TIP 3 – Low ISO. This means that you want the highest quality setting on your camera, or with film, the lowest ISO, finest-grain film. This also means more light requirements than higher ISO. TIP 4 – Stable Camera. You’ll want to have perfectly sharp images, and you don’t want camera shake to ruin them. I use a monopod for 90% of my outdoor shots. It doesn’t completely stabilize the camera, but it is great for shots down to about 1/60 second. A tripod is even better, and the best is a tripod with a camera release cord or remote. TIP 5 – Water Droplets. Water drops on the petals are a great addition, as they pick up and reflect light and other images. I sometimes take a small spray bottle to create droplets on petals. Just be careful that you and your camera are not reflected in each droplet. TIP 6 – Choose the Background. Usually the background will be blurred out from the rest of the image, as the macro nature of the shot narrows the depth of focus. But that doesn’t mean you can ignore it. Before you take the shot, look at what falls behind the image and either move your perspective, or insert something behind your flower as a new background. Sometimes a piece of black cloth or felt is a good neutral background. TIP 7 – Bugs! If you can get bees or butterflies on the flowers, it adds a dimension of motion and life to the flower. TIP 8 – Avoid Wind. If you are outdoors, even the slightest breeze can move your flower to the point of causing blur on your exposure. You may want to hold the flower steady somehow, or wait until the wind has died. Or you can try to block the wind with an object or body. TIP 9 – Depth of Focus. With flowers in macro mode, you may have to open up the f-stop to F/11 or higher to allow the entire flower to be in focus. If you keep the f-stop open, only part of the flower may be sharp. Also note that if the camera plane is not parallel to the top of the flower, you may have areas out of focus. TIP 10 – Composition. Are you after a flat-on, centered shot? Or a group of flowers with one in sharp focus? Often moving just a couple of inches down in that flowerbed will dramatically change the resulting images. TIP 11 – Shutter Speed. You want low ISO, moderately high f-stop and very still images. Usually that means a slower shutter to let in more light, and you managing the movement of the camera and flowers. With point and shoot, the camera tries to do this for you. With an SLR, I might suggest to start by setting ISO manually to 100, the F-stop to f/8 to f/11, and use Aperature Priority and Exposure Compensation to choose the best shutter and exposure. TIP 12 – Editing. I’ll often boost the contrast and saturation. You can use the levels or contrast tools to make darks darker and lights lighter. Often punching the sharpness will also add some zing to the image. Many editors have “unsharp mask” tools for this. Experiment with various black and white conversions and edits to make that flower image really stand out! So, to summarize: High sensitivity, no motion, good depth and composition, and good editing. You’ll end up with wonderful flower images. This entry was posted in flowers, how-to, Tips by admin. Bookmark the permalink.